Heroin use in the US tripled from 2007 to 2014, according to a new report from the Drug Enforcement Administration. The DEA’s findings also show deaths involving the opioid tripling in recent years, while deaths due to synthetics were also on the rise. There is a greatly expanding public health crisis, due to the use and abuse of heroin and other opioid drugs, a DEA report released Tuesday finds. In addition to the tripling of heroin use from 2007 to 2014, deaths involving heroin increased at about the same rate from 2010 to 2014, from 3,036 to 10,574. Among the findings were that the number of heroin users had grown to 435,000 in 2014, a threefold increase from 2007, for those who declared they were using. The figures are estimates. In 2015, the DEA said there more than 600,000 heroin users. The DEA found a disturbing new phenomenon among drug users – deaths from synthetic opioids such as fentanyl and other mimics of prescription painkillers. The report found deaths from synthetic opioids had increased 79 percent in just one year, from 2013 to 2014. Synthetic opioids were behind the deaths of 19 people in Florida and California during the first quarter of 2016, the agency said. The use of opioids as painkillers and sedatives was the creation of Purdue Pharma, a private pharmaceutical company in Connecticut, established by the Sacklers, three psychiatrist brothers. Arthur Sackler wrote the scientific paper that contributed to Pfizer’s successful sedative Valium becoming the first $100 million drug, leading his brothers Mortimer and Raymond to explore pain medications. They converted the generic painkiller oxycodone, invented in Germany during World War One, and installed a timed-release mechanism to stop abuse. Under that generic painkiller are product names such as Vicodin, Percocet and OxyContin. OxyContin was launched in 1995 with sales hitting $1.5 billion by 2002. The abuse-resistant claim had a loophole though. When the pill was crushed, it broke the time-release mechanism and could be snorted for a heroin-like high. Abuse, overdoses and deaths followed. The product was so successful for the Sackler family, they made the Forbes list in 2015 as new billionaires with a net worth of $14 billion. Addiction to the drug caused drug seekers to start a practice of “doctor shopping,” where they visited a number of physicians to obtain additional prescriptions. In 2012, New England Journal of Medicine published a study that found that "76 percent of those seeking help for heroin addiction began by abusing pharmaceutical narcotics, primarily OxyContin," and drew a direct line between Purdue's marketing of OxyContin and the subsequent heroin epidemic in the US. The DEA discovered that millions of patients were relying on drugs such as OxyContin, Vicodin, Percocet or Lortab for relief from severe pain but also becoming addicted. The agency first attempted to get Vicodin rescheduled in 2004, but the Food and Drug Administration rejected that request in 2008, arguing hydrocodone combination drugs had less abuse potential than other drugs in Schedule II. The FDA changed its position in 2013 as reports of abuse and overdoses grew. In October 2014, after years-long comment and hearing processes by the Food and Drug Administration and the Department of Health and Human Services, the federal government elevated highly addictive hydrocodone combination painkillers to Schedule II under the Controlled Substance Act. The new categorization meant the drugs have an accepted medical use but also a high potential for abuse. Under the rules, doctors had to write prescriptions in 30-day increments that must be filled sequentially. Prior to the regulation change, doctors were prescribing six-month supplies. What was missed, and probably couldn’t have been predicted, was that addiction was so entrenched that demand went underground to rely on illicit prescription traffickers, who produced inexpensive counterfeits containing fentanyl that can be sold on the street. What is different about the current epidemic is its location in suburban areas and outlying counties rather than the inner cities as was the case in 1970s and 1980s. Also different is the purity and price of heroin. In 1981 the average retail-level purity of heroin was 10 percent, by 1999 the purity had increased to an average of 40 percent. In 1981, the average price per gram was $3,260, and by 1999, the price had decreased to $622. Synthetic opioids such as fentanyl and acetyle-fentanyl are much stronger than heroin and can cause even experienced users to overdose, according to the report. The DEA said the heroin threat is particularly high in the Northeast, Mid-Atlantic and Midwest areas of the United States, with law enforcements agencies in cities across the country reporting seizing large quantities of heroin. Most of the heroin is now entering the US through the Southwest border from Mexico. “National Seizure System data show an 80 percent increase in heroin seizures in the past five years, from 3,733 kilograms in 2011 to 6,722 kilograms in 2015,” the report said. The report, entitled, “The 2016 National Heroin Threat Assessment Summary,” comes just a week after the UN’s World Drug Report 2016, which found the number of heroin users in the US reached around 1 million in 2014, almost three times the amount in 2003. 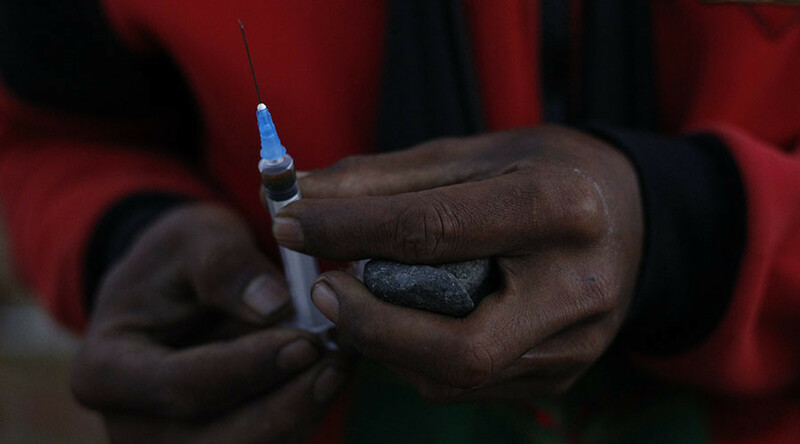 That study found heroin-related deaths have also increased by five times since 2000. Earlier this year, President Barack Obama proposed $1.1 billion in new funding over two years to address heroin and opioid abuse.